It’s much more simple and important. The next boom in natural resources is copper. Copper demand is soaring. You know the story. Electric cars, municipal-scale batteries and millions of other electronics out there. They all need copper. While we know the story, the numbers are incredible. The price of copper is up 44% in the last two years. If you don’t have a position in copper mining, you should buy right now. 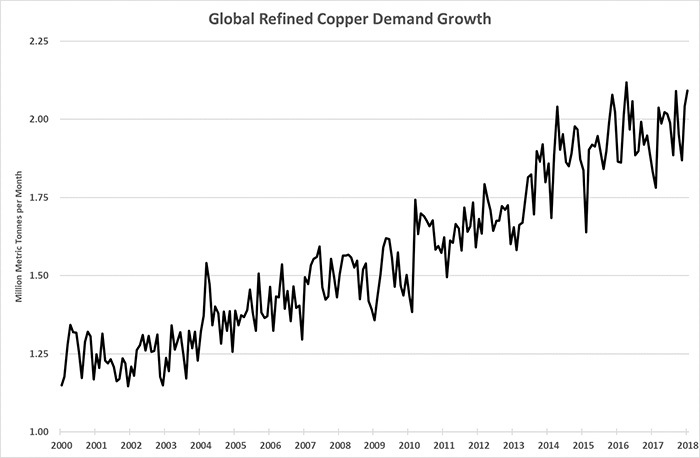 As you can see, the trend works out to about 3.4% annual growth in copper demand. That’s setting up a huge problem for the copper market in the next 10 years. According to a mining analyst with CRU, around 220 mines — about 40% of the world’s current copper production — will close over the next 10 to 20 years. In addition, mines that continue to produce will do so with lower grades — less metal per ton of rock moved. Mines can only produce so much material in a year. If the rock has less copper, then the supply will fall. That’s happening at BHP Billiton and Rio Tinto’s giant Escondida mine. After a $7.6 billion upgrade in 2015, the output fell by 200,000 metric tons per year. The average mined grade fell from 1.4% per ton in 1990 to under 1% today. That works out to a decline of 8 pounds of copper per ton of ore. In other words, demand is going up, and supply is struggling to keep up. They will diverge soon. While demand growth is 3.4% per year, supply growth will struggle to hit 1% per year. By 2028, the market will be 15 million metric tons short. Mining analysts at CRU forecast a 25% increase in demand by 2025. That’s 1.1 million metric tons more than we used in 2017. The best analog to this situation was the period from 2000 to 2015. During that time, the three-year average price of copper rose 400% from $0.74 per pound to over $3.70 per pound in 2013. The projected demand growth will send copper prices soaring higher over the next 10 to 15 years. While some substitution will occur (we can substitute metals like aluminum in place of copper in some cases), the price escalation is coming. Real Wealth Strategist readers are prepared. We own a suite of high-quality copper miners, and we will be adding new names to that list over the next year. If you haven’t done the same, you absolutely should start now. The bull market is rolling, and you can profit from it today.